There are some very talented Italian artists and artisans in Maremma, but you will often be hard pressed to find them as their workshops and studios tend to be tucked away in the villages or hamlets where they live, or in medieval alleyways away from a towns main thoroughfare. I hope you enjoy browsing through their hidden talent and craftsmanship here. If you are planning a trip to Maremma and will be staying in or near one of the villages or towns in which these artists and artisans reside, I would encourage you to pop into their studios and take a look around. When I have done so, I have never felt any pressure to purchase. You will be warmly welcomed. If you are an artist yourself, or dabble a little in the craft of the artisan you visit, do strike up a conversation... you will probably be invited to the bar next door for a coffee! It is Italy after all, and "Maremmani" - the people of Maremma - are especially friendly Italians. Please do contact the artists in these pages directly if you would like to know more about their work, explore commissioning a piece, or to take home one of their creations as a memento of a your vacation in beautiful Maremma. Most of them ship worldwide. Claudio Pisapia and his wife create Raku, Bucchero and Gres (stoneware) ceramics in their workshop in Montepescali. 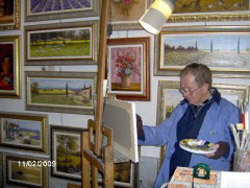 A photograph of their colourful studio is shown here. 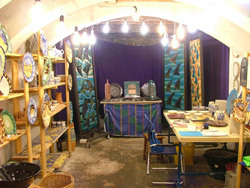 They also offer ceramic courses in their workshop in the techniques of lathe, modelling, decorating and Raku, with (optional) bed & breakfast in their home a few minutes walk away. Claudio invented a paper oven - yes, paper! 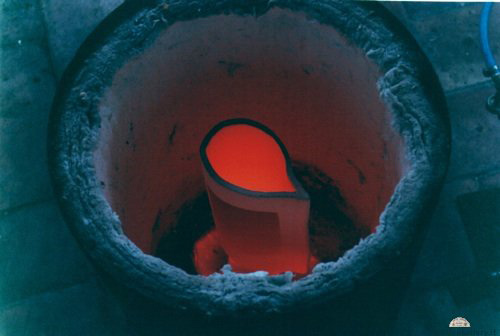 - for the baking of ceramics in a wood fire, which he demonstrates at art colleges and schools. It works brilliantly! Click on this Italian ceramics link for more information and photographs of his work. Down a very steep street in the centre of the stunning medieval city of Massa Marittima in Maremma, you will find the Goldsmith Jewellers workshop of Lorenzo Mattafirri - Orafo Design. 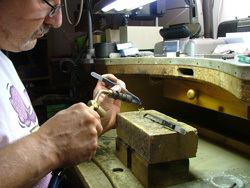 Lorenzo is an "orafo artigiano", an artisan goldsmith, whose work in silver and gold is entirely handmade and unique. 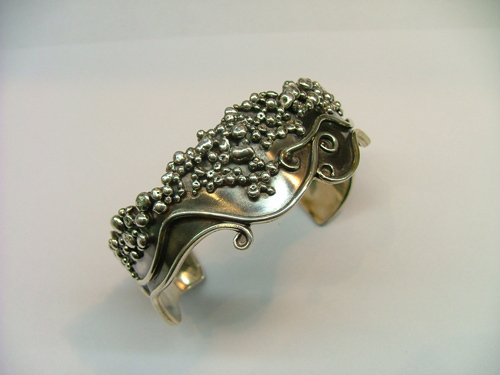 Fabio Pallanti is an Italian jewelry designer and Florentine Goldsmith with over 35 years of experience in working with silver, gold and gemstones. 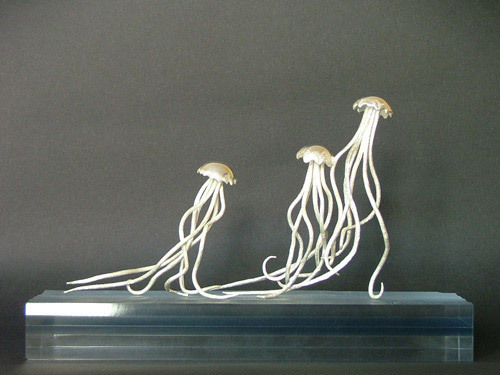 He creates stunning pieces of solid gold and silver jewelry, and unusual sculptures and contemporary Italian sculptures that reflect his passion for the sea. And he is my wonderful husband! 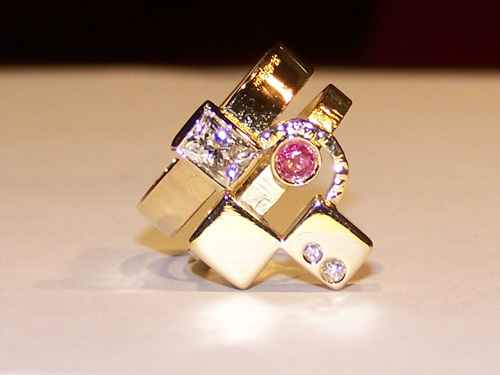 His unique silver jewellery and Italian 18k gold jewelry. Jean Santucci is an Italian painter working with acrylics and oils in the Tuscan hill town of Gavoranno. 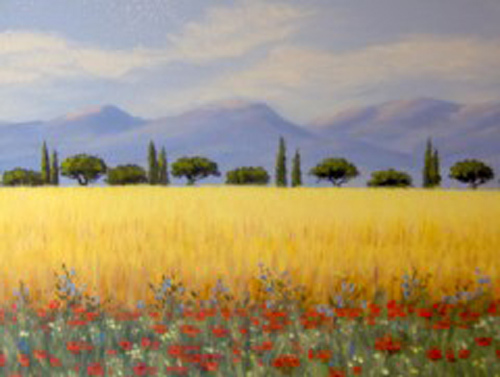 His paintings are mainly of Maremman landscapes and the medieval streets of the hill towns in Maremma, but it is apparent from his work that his life in France and other Mediterranean countries influences his style. Overlooking the medieval city walls of the castled hill town of Suvereto in Maremma Livornese, you will find Diego Daddi: an artisan Italian shoemaker with a passion for the middle ages. 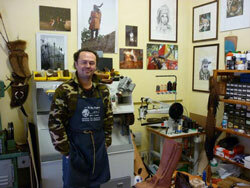 Having trained as an apprentice with an old master shoemaker, Diego now has his own small workshop where he handmakes leather shoes, Maremma hunting and riding boots, handbags and belts etc, as well as authentic replicas of medieval shoes worn by town folk, armed knights and the nobility of the twelth and thirteenth centuries. His modern-day shoes can be seen in the Italian shoemakers in Maremma page, and his range of medieval shoes here: medieval shoemaker. 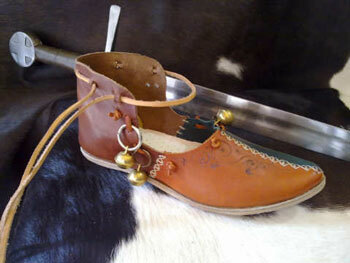 Are you an artisan in Maremma? 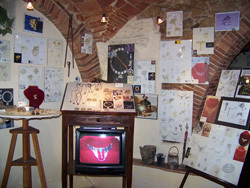 Are you an artisan in Maremma? Would you like a page of your own to showcase your work in this Guide ? It is entirely free. Click here to contact me and I will tell you what I need to build you your page and publish it to the thousands of visitors to this site every month.